I have wanted an energy-efficient multi-terabyte home file server for a long time, but until recently such a system was too expensive for my taste, in terms of both energy consumption and purchase price. But now with affordable 3 TB drives and low power Sandy Bridge CPUs the time has come to build the system I have yearned for so long. What am I looking for in a home file server? 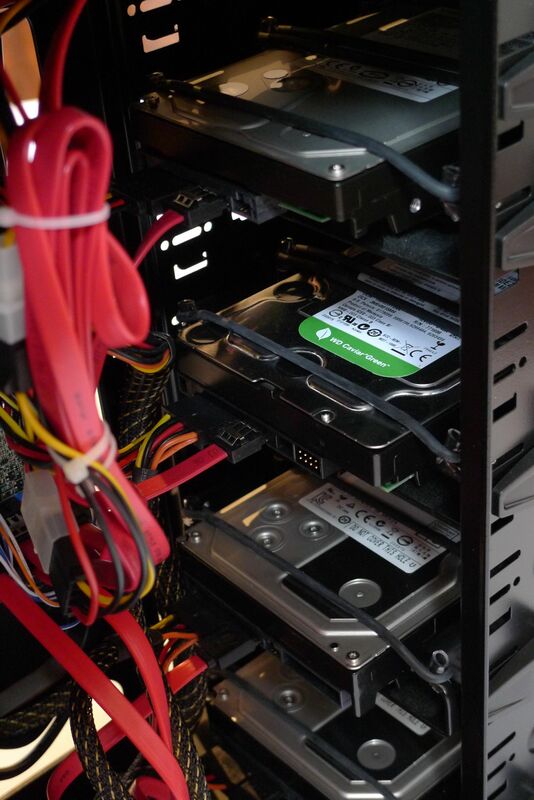 Firstly, I need a lot of hard drive space – 9 TB initially – and probably more in the future. Secondly, I am looking for ultra-low power consumption well below 40 Watts (including all hard disks). Finally I do not want to spend a fortune on the system. I might add that I heartily dislike home NAS systems. I want a Windows machine I can play around with, install software and implement my favorite backup strategy on. Although I built all my (and many friends’) PCs in the 1990s and early 2000s I have preferred buying since, mainly because it is nearly impossible to assemble a low-noise system without testing many different combinations of mainboards, power supplies, fans, etc. For this project I could not find a suitable offering from the bigger hardware vendors on the market, so I stalled it for a long time. Then the German magazine c’t published a detailed description of how to build a low-noise low-power home signal (in c’t 23/11, available for € 1,50). That was exactly what I needed: a well-tested system with reasonably-priced components that fit well together. I decided to base my system on the c’t suggestions, adding a few tweaks here and there to suit my needs. The home server is housed in a midi tower with room for 9 (!) 5.25″ drives. That allows for spacious arrangement of the 3.5″ hard disks with a free bay in between any two drives. In such an arrangement there is no need for additional fans to cool the drives, reducing complexity and power consumption. And since each 3.5″ drive is mounted in a 5.25″ bay, vibration-reducing mounting frames can be used to keep the noise level extremely low. The mainboard is an Intel DB65AL because this is one of the very few boards that combine six SATA ports with ultra-low power consumption. According to c’t, the entire computer consumes only 17 Watts (without hard disks, display switched off). One thing I missed with the DB65AL is USB 3.0 for connecting external drives at high speed. But that can easily be remedied by adding a € 10,- PCIe card. In addition to the low-power high-capacity hard drives the system contains a 2.5″ laptop hard drive I had lying around. The 2.5″ drive hosts the operating system while all data goes on the large drives. This separation enables Windows to power down the large drives during idle periods (saving 5 Watts per drive). It is also a requirement for Windows 8 Storage Spaces, which I am planning to use, but that is a topic for another article. In a file server, CPU power is of low importance. c’t used one of the least expensive models available in the Sandy Bridge line of CPUs, a Celeron G530, and I followed their recommendation. A nice benefit of this simple CPU is that the fan it comes with cools it practically silently. There is no need for expensive fans to keep the volume down. The system works very well, I am happy with my choice of components. I did add one thing, though: a 12 cm rear fan to better cool the hard drives and reduce the likelihood of a drive failure. I chose the Arctic Cooling F12 PWM. Its speed is controlled by the mainboard and it adds very little noise to the system. Looks like a great system. The only issue i have with this is that not mounting the hard drives solidly to the frame loses the heatsinking benefit of the frame. I would like to see at least one case manufacturer introduce a suspended HDD sub-chassis. That would mean that drives are screwed directly into a very solid drive frame, and the frame itself is suspended by rubber strings, or at least is mounted on rubber grommets. This might be enough to keep HDD temps low, while also keeping vibration induced noise low, too. I would also like to see such a case. An added benefit would be that the expense for the mounting frames would not be necessary. Please do not use Western Digital green for this job. They are not rated well. After having a file server online for 1 year. With about 97% uptime. One of the drives failed, closely followed by another one. On the phone to WD they said these drives are not recommended for this type of usage. You might feel differently but just a word of warning, keep a eye on your SMART. Hi simon, after a bit of reading I read a few times that the reason they die so fast is because of the intelliseek feature on the drives. there is a software you can use to disable it via the HD firmware. Hi Simon, sorry, I meant to typr intelli-park, not intelliseek. I found one of the articles again. I’ve copy pasted it here. media server applications, this is where the drives have seen their use. total or parkings in 200-300 days. drives die instead of warning the customers about the issue. I too never paid any attention to Green drives and load_cycle_count and a week ago I had a drive failure in one of two WD 1.5TB Green drives. The one still running has a load_cycle_count of 1.788.903 (after nearly 3 years of use) The next day it had increased by around 200. Popped in two new WD 2TB RED and after 3 days one drive had lcc of 1 and the other still 0.